Added by Raymond Hoh about 4 years ago. Updated over 2 years ago. Whenever we upgrade WordPress to the latest version, we have to manually reapply a fix so the login template looks alright on the main Commons site. What we've been doing in the past is adding a call to get_header() directly in wp-login.php. While this works, the HTML markup is invalid and creates duplicate <html> and <body> tags. The login template also does not look right on certain sub-sites. For example, those using the Twenty Twelve theme will notice some irregularities. I'd like to try and streamline this a bit by using object buffering and some custom CSS fixes. Is this something you will be able to get to in time for 1.8 or should we punt it down the road? Going to move this to 1.9 as the current implementation works. The method I discuss above will require a bit of dev time and testing. Moving this out of 1.9. Ray, it's not really user-facing, so if you come up with a fix, feel free to move it into a minor release. 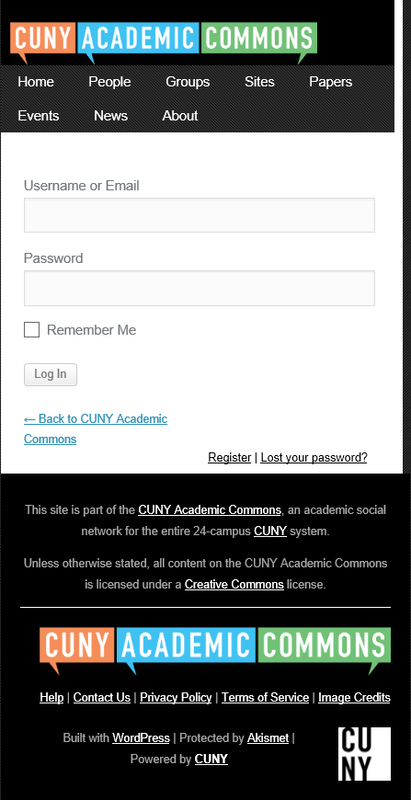 To test, go to the new cdev environment and navigate to the login page (commons.gc.cuny.edu/wp-login.php). Login page should look more integrated into the existing theme. Holy mackerel, this is a feat of engineering. Thanks, Ray. Wouldn't it be nice if wp-login.php were just a theme-styled page?